These colorful certificates are sure to inspire and reward your students. Feel free to save them to your computer for future use. To be more efficient we have fitted two certificates to each 8.5"x11" page, so just cut the page in half after printing. To make them more durable, you may want to print them on heavier paper or laminate them after they are filled in. 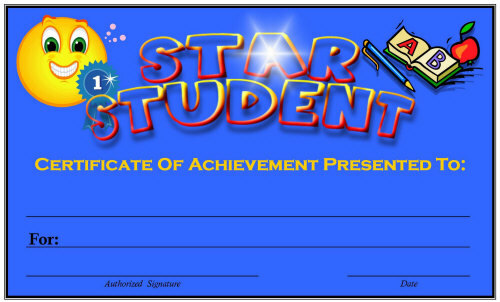 Here is a sample of the "Star Student" certificate. Actual size is about 7.5" x 5" and there are two to a page. The certificates will open in a new window so if asked by your browser please allow 'pop-up' windows on our site.